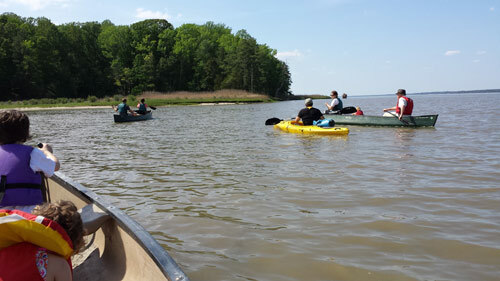 Surf and Turf at York River State Park is a special event program held on both Father’s Day and Mother’s Day but they have many canoeing and kayaking guided tours throughout the Spring and Summer such as Sunset Paddle, Mysterious Moonlight Canoe and others listed on their event calendar. He told us that we would be canoeing or kayaking (depending on what we reserved) down the Taskinas Creek out to the York River to a beach where we would stop and fossil hunt. He fitted us with life jackets and oars, reminded me how to turn the canoe using the oar (I needed a refresher) and helped me lift the canoe since it was just me and my two children ages 4 & 6. Once in the water our group of 4 kayaks and 3 canoes set off on a nice sail down the Creek and out to the River. Once out on the York we pulled up along side each other and made a pod of boats by just lightly holding on to each others boats. Ranger Brad, our guide, gave us information on the length of the river, and told some American history stories. Then, off we paddled again for 10 or so minutes to the beach, where Ranger Brad pulled everyone of our boats onto the muddy bank. Again, he entertained us with American history stories about Pocahontas’ ( Matoaka was her real name – hence, why we have a Lake Matoaka and a Matoaka Elementary in the area) and John Smith’s relationship – a very different version than the Hollywood one…but I won’t ruin it for you, I will let you take the tour and hear it yourself. Ranger Brad helped the children and adults figure out what fossils and treasures they were finding. He let everyone take one fossil home…and moms could take two (grandmoms could take 3). My kids took barnicles stuck on shells. They went for size. Then off we went again, this time muddy and happy with our treasures in tow out on the York to the Taskinas Creek and over to the dock. The whole trip took about 3 hours. It was informative, good exercise, fun and great for young and old. My children were not the youngest or the oldest kids in our group. I would definitely recommend bringing a back pack with sunscreen, bugspray (though our guide shared his with our group), water and a snack if you have small children. Depending on recent weather, the beach can be very muddy so just bring shoes that you can wash later. This was a great day trip and I would recommend it for visitors to the area and locals who want a relaxing day experiencing both surf and turf. There is one scheduled for Father’s Day June 15th- reserve ahead – Dads would LOVE this. Here is the link for Father’s Day Surf and Turf. Call to reserve your spot (757) 566-3036.